Beat the egg whites until they hold soft peaks. Continue beating and add half the sugar, adding 1 tbsp at a time, until the mixture holds stiff peaks. Add the remaining sugar all at once and beat for a few minutes only. Line a baking tray with baking paper. Spoon the mixture onto the trays, using a tbsp to shape a hollow in the centre. Bake on the lower oven shelves for 2 hours. Allow the meringues to cool, and store in an airtight container. Meringues can be made up to 5 days prior to serving. Beat the egg yolks with the sugar until pale and thick. Place the bowl over a saucepan of simmering water and stir in the lime juice and zest. Continue to stir constantly with a wooden spoon over low heat until the mixture thickens. Remove from the heat and stir in the butter. Pour into a large bowl and allow to cool. To serve, fill the centre cavity of the meringue nests with lime curd and place onto individual serving plates. 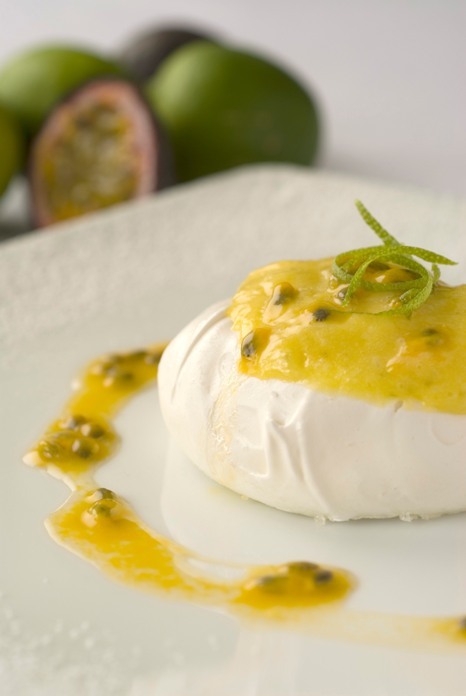 Drizzle with passionfruit pulp and a dollop of pure cream.